Disney Cruise Line offers family-friendly cruises with all the Disney-themed touches you might expect. Onboard activities include Disney-themed entertainment and character experiences. There’s lots of fun activities for kids, but this cruise line also provides plenty of options for its adult passengers too. There adult-only restaurants and spas, plus a selection of bars and lounges. 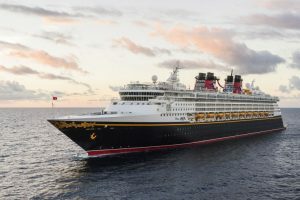 Disney Cruise Line ships sailing from Miami include Disney Magic. Nobody does family-friendly cruising quite like Disney. The Disney Magic currently splits its cruising season between Miami and New York.